Reference number for this case: 5-oct-54-Clermont. Thank you for including this reference number in any correspondence with me regarding this case. Two saucers made an appearance in the sky of Clermont, the first, within ten kilometers of Clermont, moved in west-east direction. Witnesses stated that the machine approached within 150 meters of them while they felt a curious feeling and were "like frozen where they stood"... A strong nitrobenzine odor was perceptible. The magazine indicates that on October 5, 1954, in Clermont-Ferrand, Puy-de-Dôme, Mr. Bourroux saw two luminous craft which landed on the hill of Chanturge. He observed them with binoculars but nothing occurred. The two machines took off vertically and quickly disappeared. The magazine indicates that the case was reported in the newspaper La Montagne on October 6, 1954. The two authors indicate that in Clermont-Ferrand in the Puy-de-Dome, on October 5, 1954, at 05:27 p.m., Mr. Bourroux, living on rue de la République, is on the point of closing the shutters of his bedroom when his glance is drawn to two luminous objects which move at high speed in the cloudy sky. "These two machines of round shape, of a shining white, turned for a moment above the city, hesitated, then landed on the Chanturgue hill." To the great disappointment of the witness who observes the phenomenon with binoculars, nothing comes out of these machines which take off almost instantaneously and vertically, seemed to veer, then disappeared behind the hill at a very high speed. The authors indicate that the source is La Montagne, October 6, 1954. 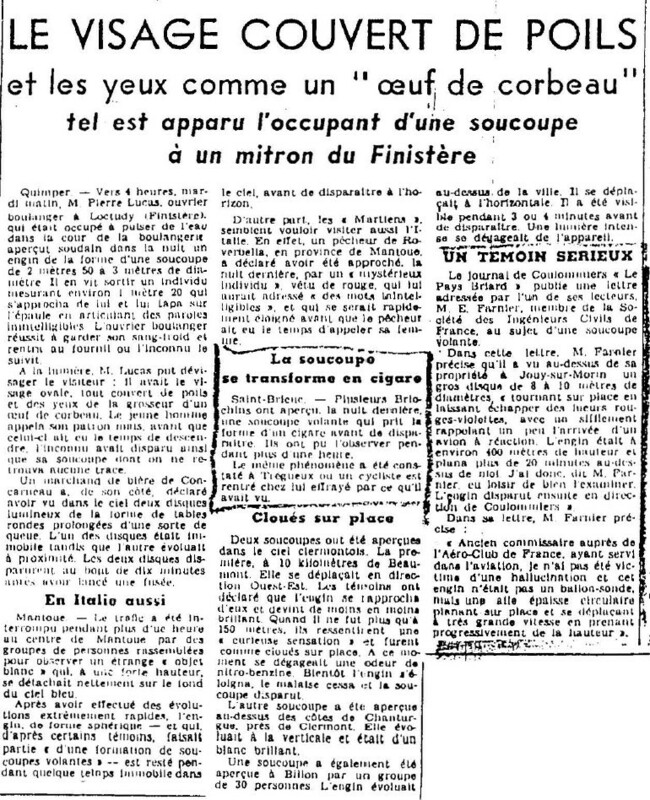 Luc Chastan indicates that in the Puy de Dômes in Clermont Ferrand on October 5, 1954 at 17:27 hours, a witness living street of the Republic, is on the point of closing the shutters of his bedroom, when his glance is attracted by two luminous objects moving at great speed in the cloudy sky. Intrigued, he observes the phenomenon with a great curiosity. "These two apparatuses of round form, of a shining white, turned one moment above the city, hesitated, then landed on the Chanturgue hill." To the great disappointment of the witness who observes the phenomenon with a pair of binoculars, nothing comes out of these machines which take off almost instantaneously vertically, seem to try to find a direction, then disappear behind the hill at a very high speed. Dominique Caudron says that it was in fact on October 5, 1954, at 03:45 p.m., in Clermont Ferrand, 63, according to La Montagen for October 7. 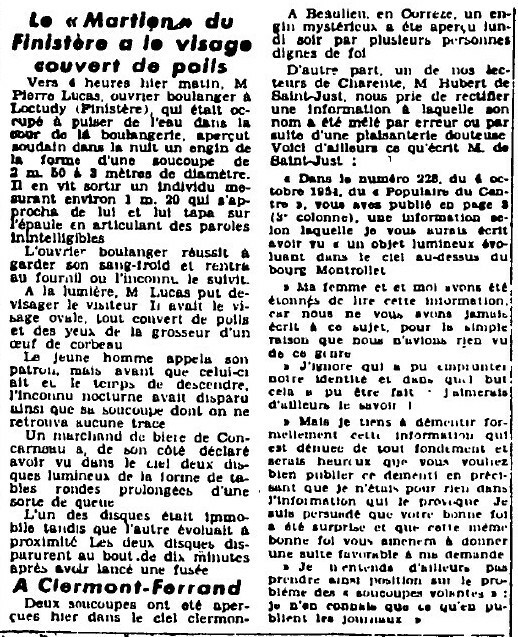 [---] Article in the regional newspaper La Montagne, Clermont-Ferrand, France, October 6 or 7, 1954. 1.0 Patrick Gross January 5, 2009 Conversion from HTML to XHTML Strict. First formal version. Additions [lc1]. 1.2 Patrick Gross January 9, 2017 Additions [pc1], [hm1], [ub1].